$9.99 a yard is quite the price for wool coatings. Chic Fabrics, 225 W. 39th Street. What's the key to surviving another brutal winter? Outerwear that makes you look and feel good, not to mention keep you warm. Sewing your own coat or jacket is a lot easier than you'd think, especially if you choose a loosely-structured style without a lot of tailoring and fitting demands. And when you make your own coat, you can customize it to meet your personal warmth needs. You can find more wool coatings on W. 39th Street at the stores west of Chic but on the same side of the street. The selection gets better but the prices do go up, starting around $18 a yard. Also, Mood Fabrics has a large selection of wool coatings at a range of price points, as do B&J, Paron's, NY Elegant and Rosen & Chadick. Don't forget linings. For warmth, I like the flannel-backed satin linings at B&J, or the quilted satins and nylons at AK Fabrics. 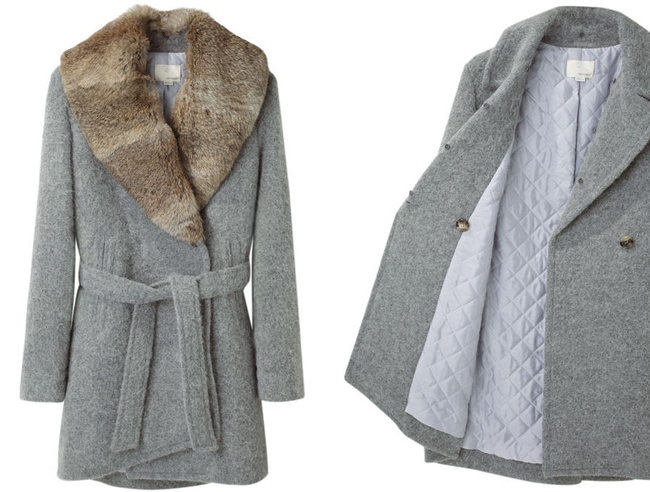 For a luxurious touch, add a fur collar from Mood or Prime Fabrics (W. 35th). Happy sewing and happy holidays! 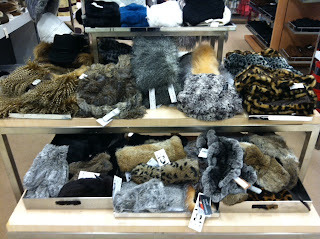 Ready-made fur collars at Mood Fabrics. Add one to that coat you're going to make. 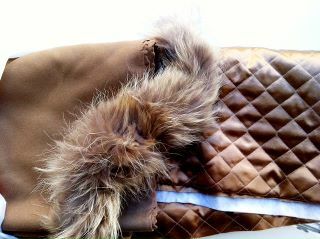 Here's my coat in progress: Wool coating from Chic, fur from Prime, quilted lining from AK. 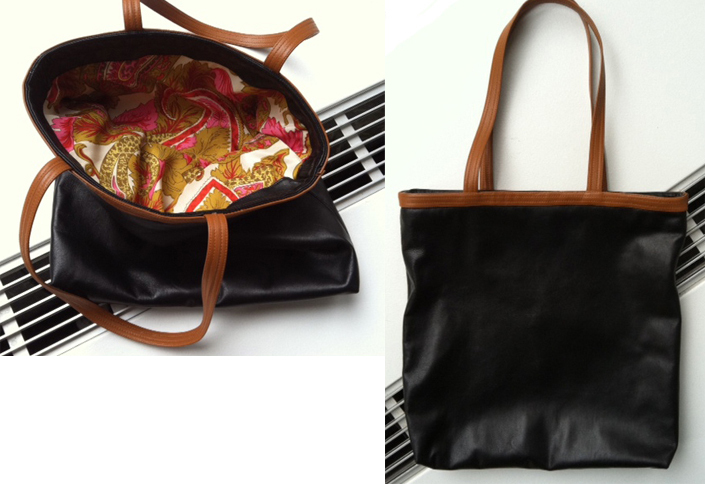 It's not too late to whip up a gift made with fabric from NYC's Garment District. Here are a few easy to sew ideas. Feel free to add your crafty gift ideas in the comments section. 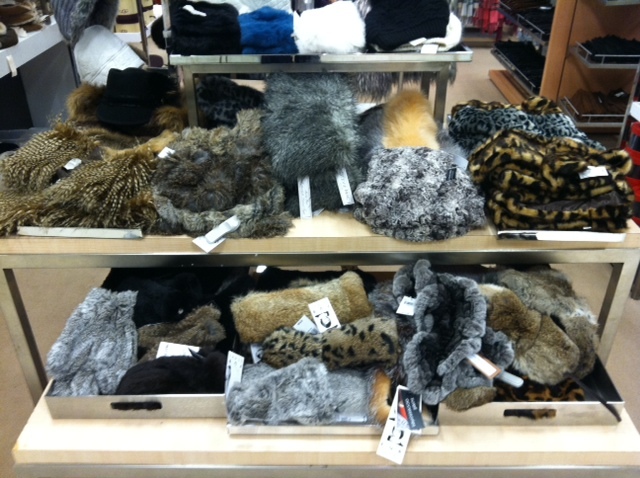 Just look at this display at Lord & Taylor and you know faux furs and faux fur collars are hot this holiday season. You can make one for a fraction of the retail price. 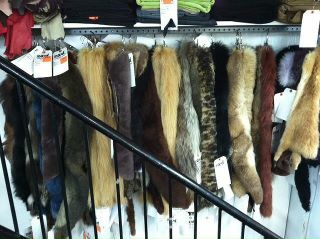 Look for faux fur by the yard at Prime Fabrics on W. 35th, Mood on W. 37th and NY Elegant on W. 40th. Know someone who's getting an iPad for Christmas or Hanukkah? 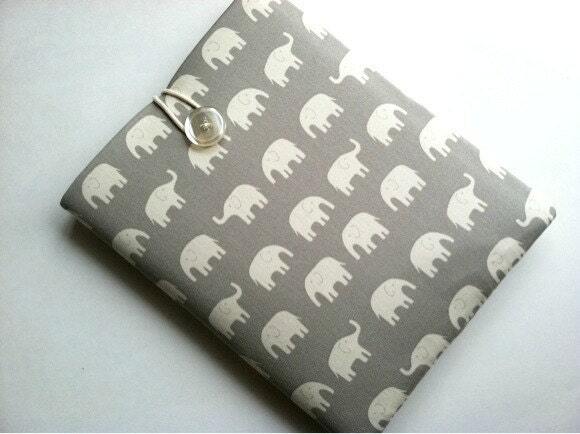 Stitch them up an iPad sleeve like this one from Bertie's Closet. Try B&J Fabrics and Rosen & Chadick for interesting cotton prints. NYC blogger and Garment District shopper Beau Baby posted yesterday about these labels from Sublime Stitching. What a great way to roust an appropriate level of appreciation for our crafty efforts. Coming soon on STGD: Holiday gift ideas to sew. Reader Candis asks: "Any upholstery shops in the Garment District?" While NYC's Garment District is the mecca for fashion fabric, I wouldn't make any pilgrimages here solely to buy home decor fabric. That being said, there are a few places that do sell home dec fabrics for upholstery, window treatments and other home fashion applications. Mood Fabrics has an entire level and staff devoted to home decor fabrics, and you can find some gorgeous things here. Ebad Fabrics on Eighth Avenue has a small selection of home dec fabrics at bargain prices. And last week I discovered that Prime Fabrics on W. 35th is dedicating its upper level to selling home dec fabrics and trims. They are adding new inventory daily. If you're open to considering fashion fabrics, then your options expand exponentially. Not so long ago I shared a cutting table at B&J Fabrics with two interior designers who were using a thick gray wool to cover some club chairs. M&J Trims has a very large selection of home decor trims and accoutrements. I'd check out the stores on W. 39th Street too, just because you never know what you'll find there. Am I missing any other home decor sources in the Garment District? Let me know! Prime Fabrics on W. 35th near Seventh Avenue now has home decor fabrics on its upper level. More home decor fabrics at Prime. Now why didn't fabric store Gate 232 have this trench coat cotton before I paid over $20 a yard at B&J Fabrics for my raincoat fabric?! $5.99 a yard is an amazing price to pay for this quality cotton fabric. I am no expert in determining levels of waterproofness or water resistantness, but it passed the Google-aided tests I administered on a swatch yesterday. (But you know what, at only $5.99 a yard you can't really hate me too much if this fabric doesn't keep you dry enough to your personal satisfaction.) Comes in light khaki and navy, and has a very sturdy hand perfect for three-season rain wear. Look for it in the middle of the store on the right-hand side. That's the khaki trench coat cotton in the center. I dropped water on a swatch and it sat like this on top of the fabric for an entire afternoon, until I got tired of the experiment. I was also unable to breathe through the swatch, which is a sign it is waterproof on both sides. Again, don't take my word for it, though; perform your own tests before you buy. Reader Arlette just alerted me to Living Social's coupon for Mood Fabrics: Pay $15 for $30 to spend on merchandise at Mood. Hurry, the offer ends today. And don't forget to support the merchants of the Garment District on Small Business Saturday by shopping there on 11/26. Many stores are open on Saturdays and would welcome your patronage. Happy Thanksgiving! Now seriously, wouldn't you rather spend a morning shopping in New York City's historic Garment District than at the mall? When you're done you can walk over to Bryant Park for some hot chocolate and a visit to the holiday shops of Bryant Park (more small businesses needing your support). Make your plans today! 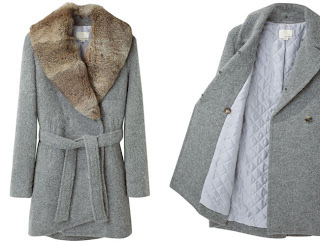 Fur Collar Trench by Boy by Band of Outsiders. Trench style wool coat with removable fur collar and self tie belt. $2,240 at La Garconne. A winter coat is one of the most satisfying and cost-effective things you can sew for yourself: You can build it exactly to your specifications, and not skimp on linings like even some of the better RTW companies do. And you can save lots of money when you make your own coat, because even on sale winter coats are still pricey. This season I am really taken with the above Boy by Band of Outsiders winter coat and am hankering to make one like it. First, I can repurpose a fur collar from an old coat that's been languishing in my closet. Second, how great is it that it has a quilted lining. Our NYC winters have been cold lately and this winter I'll be prepared with a quilted lining. Sequins, sequins, sequins! Holiday Fashion 2011 is one big sparkly mess. You, you smart little sewist you, can whip up your own little one-of-a-kind sequin number for far less than you'd pay in the better stores. Just head over to NYC's Garment District, specifically the north side of W. 39th Street. Most of the stores there have loads of sparkly sequin fabric priced between $10 and $30 a yard; feel free to negotiate your way to a lower price with the sales staff. The stores I'd start with are G&R, Gate 232 (this store keeps changing owners and names; just look for lots of tacky signs in the window and on the street), and Logo. And if you have any tips for sewing sequin fabric, please comment here. I may be sewing my first sequin dress and I could use some help! Ok, so you already know this part of New York City is the best place in the world to shop for fabrics, notions and trims. 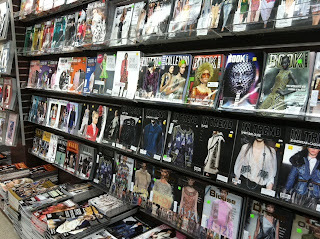 But did you know the perimeter of the Garment District also features some of the best clothes shopping around? West 34th Street is the destination if you're looking up-to-the-minute fashions at wallet-friendly prices. Cool Japanese retailer Uniqlo opens this Friday at 31 W. 34th Street between Fifth and Sixth Avenues, and I'll be picking up some of their fantastic cashmere sweaters. If you're looking for chic but affordable clothes that look great on women of all ages, try Mango, Zara, H&M and Macy's Impulse (second floor). And a DSW shoe store is currently under construction at Seventh and 34th. Be still my heart. My itinerary for a great day of shopping: Spend the morning buying fabric and trim in the Garment District. Break for lunch; indulge yourself in some macarons or mini cupcakes. Devote the afternoon to shopping on W. 34th Street, buying stylish pieces to go with the clothes you're planning to sew. For the very latest news on sales, trends and great deals in the 200+ stores in the 34th Street District, check out the fun and clever blog Fashion Herald. And you thought the Garment District was just about fabric and fashion! "The Fashion Center Business Improvement District will host its 7th annual Fashion District Arts Festival, a district-wide celebration of the artists, crafters, galleries, and theatres that contribute to the creative energy that fuels America’s fashion capital. Don’t miss local open artist studios, concerts, gallery receptions, and performances. All events are open to the public, almost all are free." Click here for a complete program guide. I hope to catch a live performance or two on my lunch hour. Hope to see you there! An entire aisle is devoted to wool knits at Mood. Mood Fabrics in the Garment District has really increased the amount of knits it now sells in the NYC store. Previously I went on and on about all the cotton jersey knits there; now I'm enthralled with all the wool knits available. Mood has carried wool knits as long as I've been shopping there (religiously for the last three years), but their inventory has really increased lately. There's doubleknits, jerseys of all weights and colors, sweater knits, cashmere, and silk blends. If you're thinking about making a cardigan or wrap for fall, pay a visit to the top floor of Mood while the pickings are so fabulous. Tell 'em Shop the Garment District sent you! Missoni? So new these bolts haven't even been tagged yet. Botani Trimmings is wooing the handbag design market with a sophisticated new leather department. Botani Trimmings, known for its luxury trims and buttons, has expanded and added an extensive leather department to woo the handbag design market. The Garment District store is now an entire block wide, with entrances on W. 36th and W. 37th Streets. According to Botani's website, handbag sample making and production are available without minimums. This new leather department is an attractive addition to the Garment District. If you're thinking about handbag design or sewing with leather, I'd add Botani to your list of must-visit suppliers. 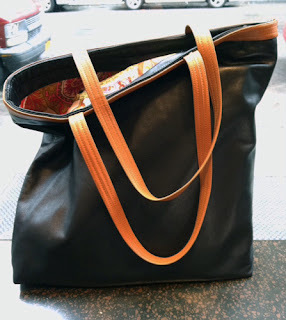 Speaking of leather, I've been thinking about sewing with leather this fall and so am trying to make it around to the places that sell leather in the Garment District. I've been to Leather, Suede & Skins on W. 35th and to Mood's small leather nook, and I plan to visit Leather Impact on W. 38th soon. A complete write-up to follow here. Readers, have you ever sewn leather before? Any tips you'd care to share here? You can get leather overload at Botani—there's so much to see. Reptile looks are hot for fall. 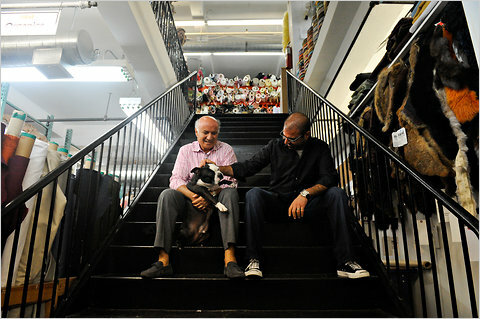 The New York Times recently ran an online feature about the Sauma family, owners of Mood Fabrics in New York's Garment District. Read the entire article here. "Designers Who Keep It Local"
Thread NY, the fashion blog of NBC 4 here in NYC, has a slideshow on 11 designers who "keep it local" and use the resources of the Garment District whenever possible. Click here to see the sideshow, and happy Fourth of July everyone! Keep it local! If you sew a lot of sportswear you should definitely schedule a trip to Shindo on W. 36th Street in the Garment District. They have the best selection of sportswear applications—braids, piping, tape, cord, etc.—that I've seen in NYC. I was also fascinated by their foldover wool braid in a rainbow of colors and super soft; this could add such a sharp finish to fall jackets, sweaters and outerwear. Shindo carries ribbons and lace and other trims as well, but unless you're looking for a specific color you can find these items at lower prices elsewhere in the Garment District. I found the staff to be pleasant and helpful (which is important because no price or content information is displayed), and I always appreciate a well-lit store in this area. Worth checking out. Soft foldover wool braid in loads of colors. 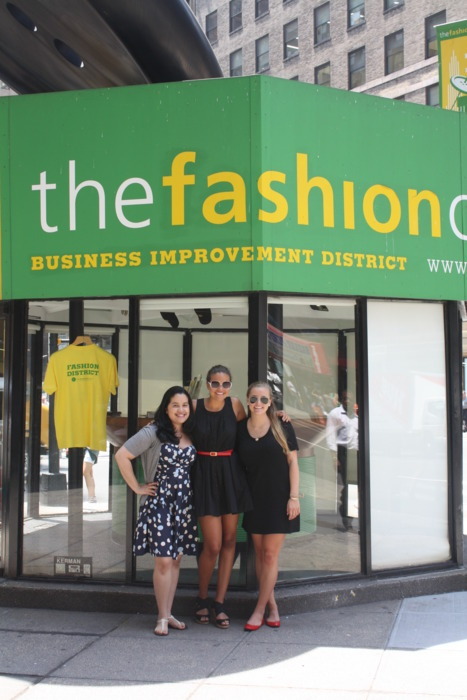 If you aren't familiar with the Fashion Center and its online database of all the businesses located in the Garment District, you should check it out. Looking for wholesale information? This site should be your starting point. People email me every week asking wholesale-related questions and I keep sending them to the Fashion Center. And do follow the Fashion Center on Facebook, because whomever posts for their fan page is funny and excels at writing clever updates. Have a great weekend!